Available for Charter in Greece! Sail in the most stable yachts, in the safest sea on the planet, with high winds through clear skies, around thousands of islands. Enjoy your drinks and exquisite meals Greek cuisine “al fresco” (outdoors), even while sailing. Swim in the clearest waters and enjoy the famous nightlife of the Greek islands. Enjoy life, enjoy Greece aboard new horizons catamaran yachts. 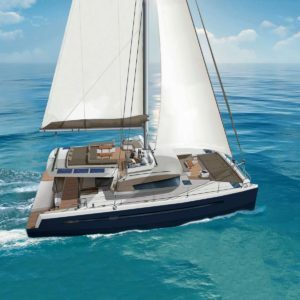 Come aboard this fully crewed catamaran yacht and enjoy 5* luxury along with legendary Greek hospitality. This stylishly uplifted brand new catamaran will conquer a place in your heart and memories. With amazing space both indoors and outdoors, she is designed to give you a comfortable and luxurious environment. Crews are chosen with the highest qualifications and are fully capable and committed to ensuring your private cruise turns into a dream holiday. Greece’s diversification makes every visit a totally new experience, and sailing is the best and only way to enjoy the most of it. Its climate offers the ultimate conditions for living outdoors. Very low fuel consumption as cat-yachts have a shallow draft! Accommodates 10 guests in 5 cabins with ensuite bathrooms. Crew of 3 with separate cabins and bathrooms. 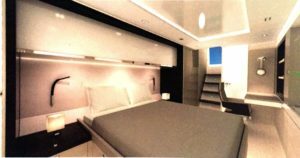 The yacht is fully air-conditioned, and equipped with 5* amenities. The yacht can accommodate 12 in her cockpit table, allowing guests to enjoy dinning outdoors all together. She has a foredeck and an upper deck salon both protected with sun awnings and numerous sunbeds to enjoy the sun when desired.